That's right, this weekend (Saturday) we attended our first board game convention - Breakout Con Toronto. We spent all of Saturday immersed in the board game world, from walking through the play halls and looking at all the beautiful games that people were playing to buying all the games, to attending some great panel discussions, it was an amazing day/experience for Lost Loot Games. After exploring the all the different areas and finding an ATM so we could buy all the things we settled into our first panel of the day, How to Play Test Well. As the name indicates this panel was discussing tips and tricks on how to play test from experienced designers including Daryl Andrews, Pam Walls, Erica Hayes-Boyouris, Jon Gilmour, and was moderated by Nicole Hoye. While we don't currently have any games in the works (at least not yet), we are interested in the game design process and wanted to understand what type of feedback is useful for designers if/when we join the world of playtesting. This was a really good panel, it flowed well and provided some great insights into the world of play testings. The panellists discussed the importance of breaking up playtesting (e.g. today we are just going to test the setup), the importance of tailoring the type of feedback you want by asking specific questions, and much much more. When the panel ended we headed back downstairs to wander around the Bring and Buy Room to look for new board game treasures. The Bring and Buy Room is a place for Con attendees to sell their used board games at decreasing prices throughout the day. At noon, two, and four the doors open to buyers who must choose to buy the game for $50 or wait till 2 or 4 to get a better price or potentially be done if someone else buys it first. It is a fun concept for some looking for a great bargain and for others a nightmare swarm of people that may not be worth the deals. The first rush at noon we lined up half an hour early to get the good deals, but it was a little bit too busy for us. People were pushy and bumped us out of the way to search through the games first and unfortunately, once you were in there was no turning back until you made it through the whole lineup. That said, we did manage to get a copy of Dead of Winter new in shrink and The Downfall of Pompeii. While I wasn't sure if I should have waited to buy Pompeii the second I got out someone further back in the lineup told me that he was looking to buy it and was sad that I got it so I count it as a victory! What wasn't a victory for our wallets but definitely a victory for our board game collection was when we went back again at 2... and at 4. 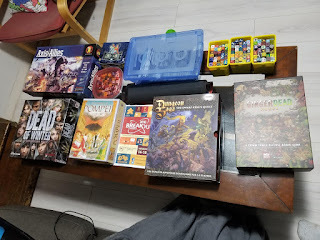 The second time through Cody bought a massive amount of Dice Masters for a pretty good price - which we will be sorting for the next week or two. The third time we went a little crazy. Cody bought a copy of Axis and Allies and Deathmatch, what he thought was a new CCG but was actually a lot of trading cards - Oops and I bought Gingerdead house -I loved the theme but no idea about gameplay, and Dungeon Sega. Between the 12 and 2 board game buy we attended our second panel of the day Making your First RPG run by Jonathan Lavallee with Mark Richardson, Anna Kreider, Emily Griggs, and Misha Bushyagar. While we haven't dived too deep into the world of RPGs Cody has become increasingly more interested via the Secret Cabal podcast. The panel featured some very interesting panellists with a diverse background offering some insight into the difficulties of breaking into the industry as a marginalized person and the key is to not let perfect get in the way of good. Overall it was an interesting panel and a facet of gaming we soon hope to explore a little more. I sometimes catch Cody eyeing up RPG books at our LGS and have played with the idea of Call of Cthulhu RPG book and would love to try it. After the RPG panel, we took a little bit of a break to look around again and play some games. With limited space and time before our next panel and Bring and Buy Effort we decided on a filler game and were talked into Deadman's Draw. Deadman's Draw is a small push your luck card game with a pirate theme, that was originally an app. With most of the gaming room full (and rather warm) we decided to play on a small makeshift table in the hallway, it felt very much like home. The final panel was Breaking into Board Game Design run by Daryl Andrews with speakers including Sen-Foong Lim, Rob Daviau, Allysha Tulk, and Nicole Hoye. This panel offered some amazing advice in terms of what you would be hoping to get out of your board game design, how to break into the industry, the differences between producing your own game and using a company, and how to take real-life experiences and make them into great games (Mountains of Madness). Because this panel was so great we wish they had spent more time on those topics and less time talking about how they got into the industry - with such a short amount of time it made it seem way too easy. While their origin stories were cool we wanted more on board game design. Despite that, this panel was our favourite, the panellists had some great advice and great stories from the industry. It made us want to go home and start designing right away, in fact, Cody is currently working on a new game idea right now! More board game cons, please! This was such a great and positive experience for us, seeing everyone hanging out and playing new games was so cool. I also want to attend more conventions and designer nights in the future but this could just be my board game convention high talking. If you are thinking of doing more in the community or being a part of the industry I would recommend attending as many of these as you can. I am already trying to find out when the next event we can attend will be!